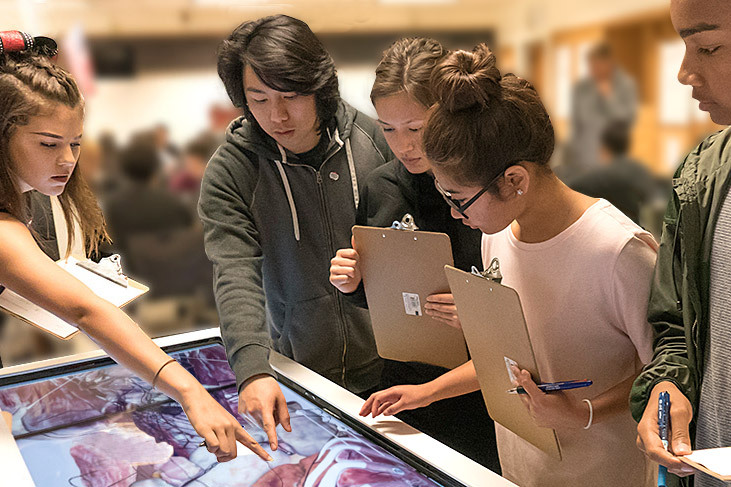 Long Beach Unified is the first school district in the nation to purchase life-size virtual dissection tables for its high school health-medical pathways. The Anatomage Table features high-quality imaging software to examine real human anatomy and includes virtual cadavers that are completely annotated and fully dissectible via touch screen. Lakewood, Poly and Sato high schools are the first to receive the tables, which are funded by a state grant to support career and technical education. "The virtual dissection table shows great promise as an educational tool," said LBUSD Superintendent Christopher J. Steinhauser. "We want our students to have every possible advantage as we prepare them for success in college and careers. By piloting this device with high school students, we're giving them and their teachers the same, key resource used by medical schools and universities." The device manufacturer, Anatomage Inc., says they’ve created the world’s first and only life-sized digital dissection table. View a video of Choi demonstrating the device on youtube. High-resolution anatomy allows for the viewing of small structures such as nerves or blood vessels that are difficult to see by any other means. The technology has helped to produce improvements in student test scores in anatomy courses, the manufacturer said. The device made a good first impression at Lakewood High, where teacher Aaron Volkoff last week piloted the first lesson created specifically for the Anatomage table. FIRST IN U.S. – Three local high schools are the first in the nation to pilot virtual dissection tables in science classes. Here, Lakewood High School students participate in the first lesson designed for the high-tech Anatomage tables. The devices are used at medical schools and universities.